It’s Elvis Week! To celebrate Write On! is pleased to have film and pop culture expert Dr. Susan Doll, author of Elvis for Dummies, which was published in July. A film instructor with 20 years experience teaching on the college level, Doll currently works as a researcher and writer for Facets Multi-Media in Chicago and writes regularly for the Turner Classic Movies Website. She has written a dozen books. When did you first catch the writing bug? Back in the early 1990s, I had written a few Elvis books, which came out of the research I had done for my dissertation. But, I did not consider myself a writer. I just thought that this was a bit of good luck and so I continued my career in publishing as an editor, which I really enjoyed. When I was laid off from the publishing company (PIL), I worked as a freelance editor and project manager. To my dismay, freelance editors did not garner much respect but writers always did. Even if the writer was bad and the freelance editor good, the latter did not command the same respect. When the bulk of my clients no longer hired freelance editors (as soon as George W. Bush was elected), I decided I would pursue writing as a second job, rather than editing. Why Elvis? How did you end up with a specialty in Elvis and pop culture? I have an MA and a PhD in radio, television, film studies from Northwestern University. I did my dissertation on Elvis Presley and how his Southern background affected his entire career. When Publications International, Ltd. (PIL) found out that I was writing my dissertation on Elvis, they came to me to write a decent career-oriented coffee-table book about him. At the time (1989), there were few coffee-table books on Elvis with beautiful photos and a positive outlook on his music/films. The book, Elvis: A Tribute to His Life, did very well. So, I wrote a few more books for PIL, though I was technically working for them as an editor. It was an unusual arrangement with them but beneficial to me in the long term. When I decided to pursue writing as second job, I began to write articles and reviews for any client who would hire me, just to get the experience so I could bill myself as a writer for hire. Though I am a film and pop culture historian, I took jobs writing biographies on anybody for the Encyclopedia Britannica Yearbooks; I even wrote articles for them on consumer goods and trends in business/retail. Ugh! I also wrote on history subjects for a Facts on File reference book and found I really liked researching and writing about history. I contributed an article to a book called Ordinary Reactions to Extraordinary Events (about famous disasters). Eventually, as an experienced writer, I was able to focus on film and pop culture subjects. For a while, I wrote with a partner, and we were able to land a literary agent. We wrote a book called Florida on Film, which our agent was able to sell to the University Press of Florida. Then last year, I became a contributor to Turner Classic Movies’ blog. It is a paid position and you have to have a proven background in film to be considered. I am quite proud to be one of the Movie Morlocks (the name given to the TCM bloggers). This year, my agent helped me land the Elvis for Dummies gig. Do you have a favorite little known Elvis-fact? I have a couple. I like little-known stories that counter the mainstream image of him as some fat, drug-addled relic of the 1970s. One of my favorites is that in 1961, in one of his last concerts until 1969, Elvis gave a benefit performance to raise money for the U.S.S. Arizona memorial in Honolulu. Fund-raising efforts had stalled, and when Elvis stepped in, not only did he raise money, he raised awareness so that other groups and individuals chipped in. Without him, efforts would have dragged on for years, or completely stalled. I believe there is a plaque near the memorial somewhere thanking him. What was the process of getting and working on a Dummies book? 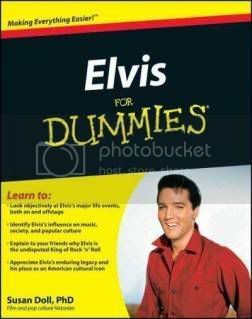 I thought interpreting Elvis’s career or analyzing his cultural significance would be a perfect topic for a Dummies book. So, I asked my agent to approach them. Coincidentally, Wiley Publishing, Inc. (the Dummies publisher) was considering branching out into pop culture, and they wanted to begin with Elvis. But, they did not know where to find a writer. Then my proposal just landed in their lap via my agent. What was your favorite part of writing Elvis for Dummies? The greatest challenge? I relished the opportunity to explain/interpret Elvis’s career and significance to people who might not be fans. I don’t think his entire career has ever been objectively evaluated. Books are either questionable memoirs by people who worked for him, biographies by music historians who dismiss his film career, or fawning photo books that offer no perspective. I really think that as one of the most influential figures of the 20th century, he has been given short shrift. I am satisfied that I could address that. The most challenging part was writing in their rigid format. In a Dummies book, the idea is that someone could pick up the book in the middle and read part of a chapter and learn something. Therefore, there is built-in repetition, yet you need to be careful of sounding repetitive. Each chapter begins with the conclusion—or the main point of the chapter—in case the reader doesn’t read the whole chapter. It was like writing backwards for me! How do you balance the elements of your career? It’s difficult. I wish I could make enough money as a writer to work only as a writer. Between my full-time job at Facets and writing or teaching, I continually work two jobs. If I don’t have a long-term writing job, I teach for a semester. I am very fortunate that both my jobs are in my field, so in a way I feel blessed. However, I work 7 days a week. Sometimes I work all day, then come home and write/research. A day off for me is when I only work one job on that day. What are the similarities to the types of projects that you do? The differences? I am lucky that almost all of my work is film or pop culture-related. I research and write about film for Facets—anything from DVD wraps to booklets inserted inside the DVDs to handouts for viewers who attend our cinematheque. Then I research and write about film for the Turner website, and for the occasional additional client. Currently, I am fact-checking a book on Hollywood lore and history for PIL. Sometimes, I will research and write about something not related to film. For example, I co-wrote a little book, which I published on ghost stories from the area of West Virginia where my family is from. The stories were told to me by the old-timers of the area, and I researched the history behind them, and a partner and I wrote them up. The people of Tyler County, WV, were so happy that a couple of writers focused attention on their area that they have been incredibly supportive. That experience has meant a great deal to me, though I will never make much money from it. Any tricks for keeping track of research? Wish I knew some. I am very old-fashioned regarding research. I take notes on all sources, and the act of taking notes and organizing my thoughts forces me into a rough draft in my head of what I want to say. I keep most of my paper research in files, and I have used and re-used the information in them. Everyone keeps pressuring me to incorporate my computer into organizing my research, but the creative part of research is assessing it as you read the information. There is no short cut to doing that, and for me, my process of assessment occurs when I take notes by hand. Stay away from the Internet!!! It’s the lazy way to research. It is a source, and a poor one at that, not a substitute for a library. Of course, some subjects fare better on the Internet than others; Internet sources on pop culture/film are generally unreliable and sometimes downright dismal. Even the IMDB is not faultless, especially with foreign and documentary films. I will give you an example, with the Hollywood book I am currently fact-checking, the writers had to list their sources at the end of each piece they contributed. Those writers who used only the Internet made 50 to 75% more mistakes than those who used book sources! That’s 50 to 75%! How valuable it is to have a literary agent. Tags: Author Q&A Elvis for Dummies Facets Multi-Media Chicago Non-fiction Pop Culture Publications International Ltd. Susan Doll Turner Classic Movies Wiley Publishing Write On! Write On! 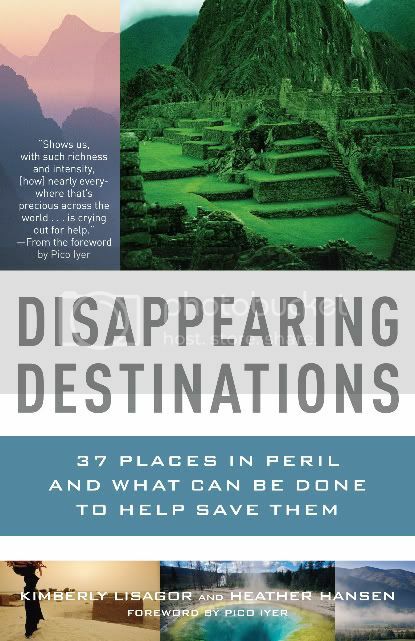 Q&A: Kimberly Lisagor, "Disappearing Destinations"
I am presently reading Elvis for Dummies. I thought I knew Elvis better, but reading this book has opened up my eyes to better understand just what impact this man had on music as well as generations of people. Thank You Susan Doll for such an insightful view into Elvis and who he REALLY is. Thanks so much Jim. I appreciate the comments and support. Very timely, since today is EP’s birthday.